Whisky is a powerful memory trigger, whether it’s through aromas, flavours or recalling a specific time and place where a dram was enjoyed. Crime novelist Ian Rankin is a man who knows this well. He recently shared a selection of whiskies from distilleries of significant meaning to him with Dave Broom – each paired with an equally memorable song. 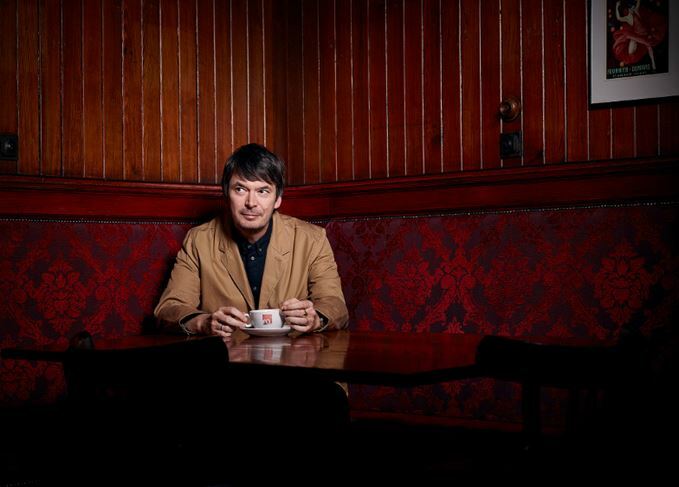 ‘Don’t worry about specific bottlings,’ said Ian Rankin when I suggested the idea of desert island drams (and tunes). ‘Something from each distillery will do.’ I dug out some from my stash, supplemented by generous offerings from the Scotch Malt Whisky Society (and a last-minute emergency donation from Charlie MacLean). Our discussion of whisky, music, work and life follows yesterday’s in-depth interview with the best-selling crime novelist, which covered the ever-changing character of detective John Rebus and the deeper significance of crime fiction. ‘This takes me right back to my teenage years in Cardenden. My dad wasn’t a connoisseur, but one year I bought him a bottle of Bowmore for Christmas. He loved it and it had pride of place in the wee drinks cabinet. When I see or drink Bowmore, it takes me straight back to my dad. We’re listening to Sensational Alex Harvey Band’s Boston Tea Party. ‘In 1982 after university, my girlfriend (now my wife) and I went to France and worked for six months in a vineyard. In August, we decided to hitch around the South of France and Italy where we got picked up by two Irish lorry drivers. When they stopped for the night, out came the Jameson. I’m saying: “I like Scotch”, then I tasted it and thought: “It’s lovely.” Whenever I get an Irish whiskey it takes me back to that first overseas trip. ‘Miranda [his wife] grew up in Belfast and whenever we go over I like to go and have a few whiskeys. I love all those southern Irish ones: Powers, Jameson, Crested Ten. ‘One Christmas I was in the Crown in Belfast and ended up sitting in a booth with a guy who was drinking Crested Ten. It turned out he was a TV director, Tony Knox, and we ended up making a TV series on evil together. That’s whiskey. ‘We met an American guy at the vineyard. When he came over to Scotland, I borrowed my aunt Jenny’s car and he and I went on a whisky trail, visiting as many distilleries as we could. By the end of the trip, we parked the car at night outside a distillery’s gates, slept in it, and when the gates opened we drove in and said: “We know how you make it, just take us to the tasting room!” That was Glen Grant. It was the bottle we came back with. Plus a T-shirt. It was a lovely trip. ‘The Society one is oleaginous, the 12-year-old I could drink without water – a daytime whisky. The music is Spandau Ballet’s True. ‘On Rebus’ 20th anniversary, Highland Park invited me up to Orkney to choose a single cask. Of the six samples, I liked numbers two and three. They asked me: “What one would Rebus like?” I said: “Number 6… the head-banger,” so that’s the one they bottled. For the 30th anniversary [this year] they said they’d do another. ‘Rebus isn’t a connoisseur. There’s 15 to 20 whiskies mentioned in the series, but Highland Park is a regular. There’s just enough smoke on this, giving it that coastal quality. Some people prefer Scapa, but for me it’s always Highland Park. ‘I chose Solid Air by John Martyn to go with it. ‘As I get older, I think my taste buds are shot and I need a heftier dram, which is where the big, peaty Western Isles ones come in. I need to put water in to open it up because the style is too intense for some, just too medicinal. But late at night when Mr Rebus isn’t drinking Highland Park and listening to John Martyn, he’ll be drinking Laphroaig and listening to something like Jackie Leven’s Exit Wound. ‘Wow. This is rich. I’ve drunk some lovely old Glenfiddichs, mainly because Iain made me. This is lovely. There’s no way I could drink Glenfiddich and not think of Iain. Whisky has taken to the driver’s seat in the development of Formula One and Nascar racing.